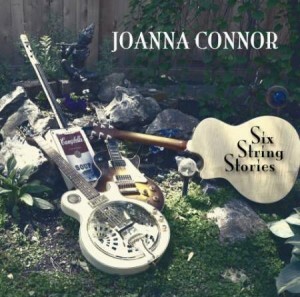 In the language of social media, the video clip of Joanna Connor at the 2014 North Atlantic Blues Festival went viral. She gives the rapt audience a three minute display of her astounding slide guitar playing, a performance that has been viewed over 870,000 times on-line. For many people, that may have been their first exposure to Connor – but Chicago-area fans have reveling in her club performances for several decades, reaching back to her first release, Believe It, in 1989 on Blind Pig Records. After a fourteen year recording hiatus that had Connor focusing on raising her daughter, she is back with her second release for M.C. Records. Exploring that vast territory where blues and rock converge, she offers plenty of fiery playing that mirrors what viewers saw in the video. Take “Halsted Street,” a brooding instrumental with some gentle acoustic guitar wrapped around eerie, effects-laden electric tones. Suddenly, her guitar erupts with a solo sequence that would make Eddie Van Halen proud. The slow blues, “We Stayed Together,” centers on her impassioned vocal bracketed by two penetrating guitar interludes. “Love Coming On Strong” is a primal stomp about love swirling out of control, following the instrumental “Swamp Swim,” with guest Omar Coleman’s harp intertwining with unearthly slide tones to form a haunting sonic landscape. Connor shifts to a more positive frame of mind on “Heaven,” the arrangement bolstered by Charlie Kimble on tenor sax, Gary Solomon on alto & soprano sax, and Charles Pryor on trumpet/flugelhorn. Lewis is moved by the spirit, preaching with the fervor of true believer. A staple of her shows, Connor shows her interpretive skills on a live recording of the Elmore James classic, “The Sky Is Crying,” her nimble six-string phrasing mirroring the agony in her voice. “Young Women Blues” is a dreamy stroll that mixes jazz elements through a tremolo-induced haze. Appropriately titled, Six String Stories should build on the world-wide interest generated by that short video. Once people hear Joanna’s new disc, no one is going to classifying her as as anything other than first-rate.